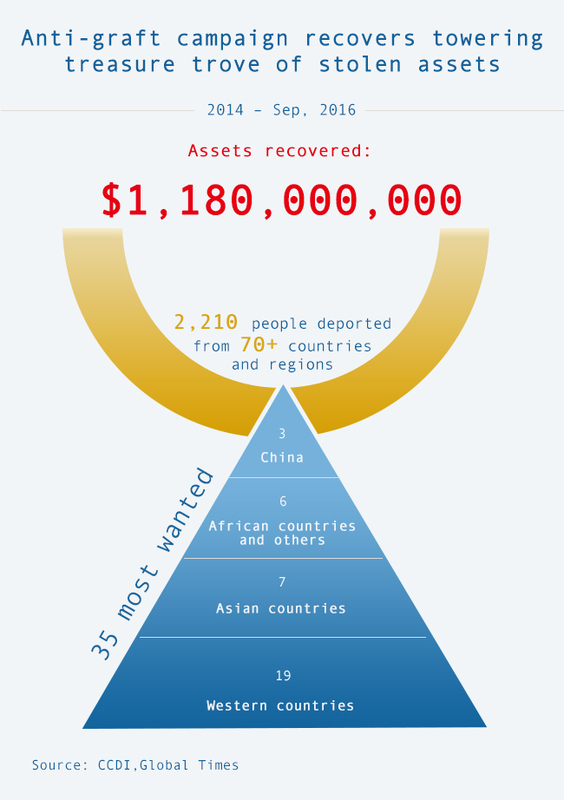 China's anti-graft campaign has netted 35 people suspected of being part of its 100 most wanted by September, most of whom were deported, highlighting China's efforts to work together with the international community against corruption. China's anti-graft watchdog, the Central Commission for Discipline Inspection (CCDI), reported Sunday that half of the 35 people fled to Western countries including the US, the UK, Australia and New Zealand. China does not have an extradition treaty with those countries. Among them, 7 were detained in Asian countries, including Cambodia, Singapore, South Korea and Malaysia, 6 in Africa and 3 in China. They are suspected to be involved in embezzlement, bribery and fraud, and half have been accused of corruption, the CCDI said.